The Young Engineer Conference, dedicated to the memory of the late Professor Kenny Price, was organized by the Israel Sci Tech Network in collaboration with the Technion, and sponsored by Lockheed Martin. 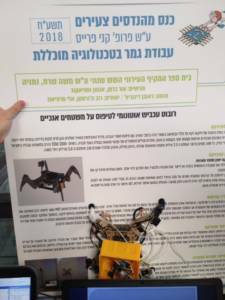 It took place in the Technion in Haifa, on April 11, 2018. 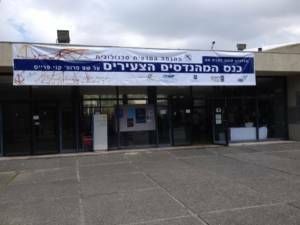 About a decade ago, the Israeli Ministry of Education and Israel Sci Tech Network initiated the establishment of the Science & Technology Study Programme, aiming to advance and enhance the studies of science and technology in Israeli schools, to encourage students to pursue higher education in STEM fields, and to foster the future engineers of Israel. This study programme draws students with strong study skills, and motivation for learning. On top of their required subjects, these students take on five expanded majors: Math, English, Physics (mostly) or Biochemistry, and Engineering Sciences (a unique subject taught in this programme only). To top it all, the students co-create a group project. The annual Young Engineer Conference is attended by 12th-graders studying at the Science & Technology Programme, led by the Israel Sci Tech Network’s Goralnik Institute for the Enhancement of Teaching & Learning, in collaboration with the programme’s inspectorate at the Ministry of Education. 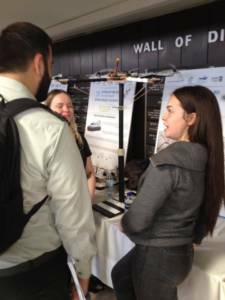 During the conference, students present the projects that they have designed and developed through their studies. Each project addresses some societal issue, using aspects of science and engineering to realize a solution. The students work on their projects for two years on average, as part of a team comprising 3-5 students, where each student have their own assigned roles and responsibilities. The conference began with several simultaneous panels of student-speakers, then proceeded to an exhibition of the students’ creations, and concluded in a celebratory ceremony with announcements of the contest winners, and special awards for exceptional students. This year, the conference was attended by some 250 12th-graders from all over Israel, representing almost all walks of Israeli society (Jewish, Arab, Druze, general state education as well as religious state education). This conference enjoyed a boost from the leading international corporate in the fields of aerospace, defense and technology: Lockheed Martin, which sponsored and accompanied the conference. This company provides advanced products and services to thousands of government and intelligence agencies, security forces, and corporates, in the USA and all over the world. 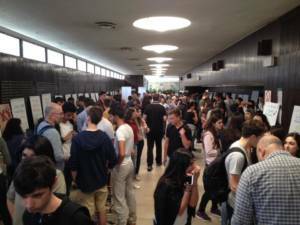 This year, it had chosen to invest in the future generation of young engineers emerging in Israel Sci Tech Network. Brigadier-General (Ret.) Joshua Shani, CEO of Lockheed Martin Israel, viewed the exhibition and heard explanations about projects created by Sci Tech Israel students. In addition to the programme’s senior students, the conference was attended by some 300 ninth-graders who’ve showed potential for, and interest in, joining the Science & Technology Programme next year. The conference’s participants came from 23 high schools running a Science & Technology Programme, 12 of which belong to the Israel Sci Tech Network. There were 65 projects presented, 37 of them created by Sci Tech students, addressing various issues which were divided into a number of categories, including biomedicine, space exploration, social awareness, ecology, robotics, safety, training & instruction, communication, and more. The projects were refereed by academics, businessmen, military personnel, and teachers from technological fields. Among the many innovative and creative projects presented, a few that drew particular appreciation from the referees included Motion-Based Messaging developed by Sci Tech Alon Ben Gurion, Afula; Mute Understanding by Sci Tech Bustan El-Marj; Safe Chest Drainage by Sci Tech Greenberg, Kiryat-Tivon; Advance Warning Bracelet for Cardiac Arrests by Sci Tech Naomi Shemer, Gan-Yavne; Home Kit Diagnosing Bacterial Urinary Tract Infection by Rabin High School, Tel Mond; Home Sleep Laboratory by Rabin High School, Tel Mond; Spider-Like Climbing Robot by Sharet Comprehensive High School, Netanya; Soil-Sampling Robot by Hama’ayan Comprehensive High School, Rishon LeZion; Aero Baby by Sci Tech Modiin; Medicinal Hive by Sci Tech Modiin; The Green Cow by Sci Tech Modiin; Access Management System for Restricted Resources by Mor Metro-West High School, Ra’anana; and more. There was palpable tension in the main hall during the announcement of the referees’ decisions, and the names of the winners. A full year scholarship in selected institutions – Tel Aviv University (Faculty of Engineering), The Technion, Ben Gurion University in Be’er Sheva, and the Hebrew University of Jerusalem – was awarded to the first prize winners, Netef Or and Amber Oren, students at Hama’ayan Comprehensive High School in Rishon LeZion, for developing a soil-sampling robot. A 75% scholarship for one year in selected institutions – Tel Aviv University (Faculty of Engineering), The Technion, Ben Gurion University in Be’er Sheva, and the Hebrew University of Jerusalem – was awarded to the second prize winners, students at Mor Metro-West High School, Ra’anana: Shavit Zamir, Itay Dinar, Shay Guli Morad, and Shelly Rabinovich, who developed the SHARELOCK system for managing access to restricted resources. A 50% scholarship for one year in selected institutions – Tel Aviv University (Faculty of Engineering), The Technion, Ben Gurion University in Be’er Sheva, and the Hebrew University of Jerusalem – was awarded to the third prize winners, Or Berman and Anton Veshnyakov, students at Moshe Sharet Comprehensive High School, Netanya, who developed an autonomic spider-robot for climbing vertical surfaces. The Innovation Category was won by students at the Rabin Experimental School, Tel Mond, for developing a home sleep lab, meant to monitor and remedy insomnia. The Creativity Category was won by Sci Tech Modiin students: Keren Azov, Maya Navon, and Amit Meisel, for the development of the Aero Baby – an application designed for pregnant women, monitoring their physiological parameters during exercise. First place: Noga Aharoni and Yifat Denzinger from Sci Tech Greenberg, Tivon, who developed a system for safe chest drainage. Second place: Sharef Zuabi, Rena Shalbi, and Rima Sa’ad from Sci Tech Bustan El-Marj, who developed the Mute Understanding system, aimed to assist patients who have difficulties using their vocal chords following an operation. Third place: Billy Carmeli, Ran Even Shoshan, Erin Freitag, and Omer Sherman, from the Rabin Memorial Experimental School, Tel Mond, who developed a home kit which diagnoses bacterial urinary tract infection, and monitors the antibiotic treatment.